From Mali to Afghanistan, Syria and Iraq, Islamist fighters have regularly turned their sights on the priceless vestiges of peoples' cultural heritage -- for being un-Islamic. The International Criminal Court on Monday opens the war crimes trial of a jihadist charged with orchestrating the destruction of shrines at the World Heritage site of Timbuktu in Mali. The following are examples of world cultural heritage destroyed or damaged during recent conflicts. The fabled desert city of Timbuktu, named as the "City of 333 saints" and listed by UNESCO, was for months attacked by jihadists bent on imposing a brutal version of Islamic law. 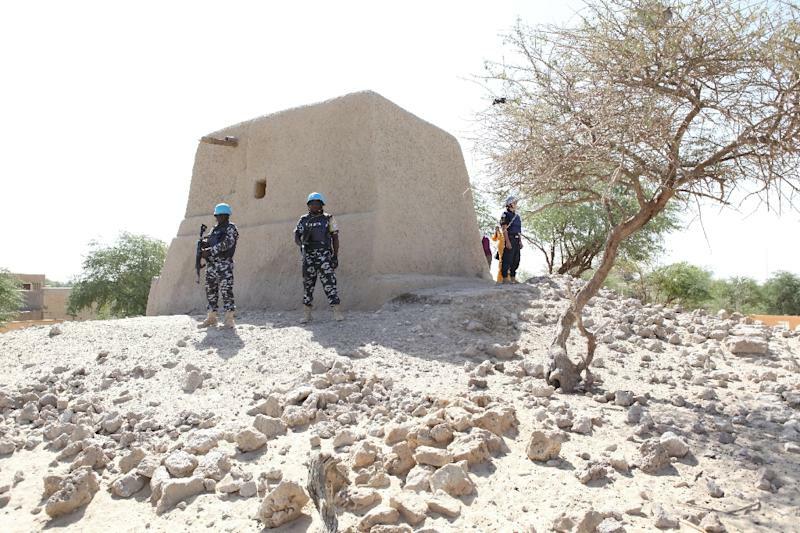 In June 2012, Al-Qaeda-linked militants destroyed 14 of the northern city's mausoleums, important buildings that date back to Timbuktu's golden age in the 15th and 16th centuries as an economic, intellectual and spiritual hub. The reconstruction of the shrines began in March 2014, relying heavily on traditional methods and employing local masons. Several countries and organisations financed the reconstruction, including UNESCO. Work finished on the site in July 2015, and a ceremony marking the completion was held on February 4, 2016. 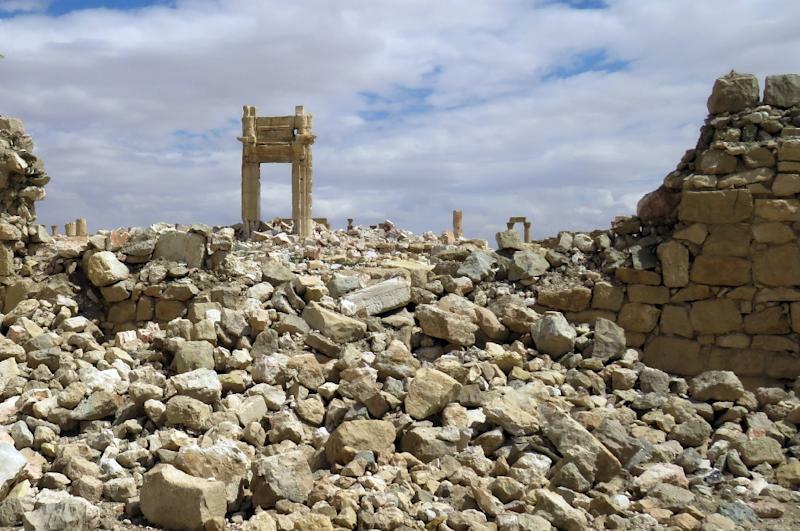 More than 900 monuments or archeological sites have been looted, damaged or destroyed by the regime, rebels or jihadists in Syria, where a devastating war has raged since 2011, according to APSA, the association charged with protecting Syrian architecture. In September 2015, Islamic State (IS) fighters destroyed two of the most important temples in the UNESCO-listed Syrian city of Palmyra as they pressed a campaign to wipe out some of the Middle East's most important heritage sites. They include the ancient city's most famed shrine, the 2,000-year-old Temple of Bel, blown up a week after the destruction of the temple of Baal Shamin. Other notable sites damaged or looted include Dura-Europos in eastern Syria, once known as the "Pompeii of the desert", Apamea, Ebla and Tal Ajaja. 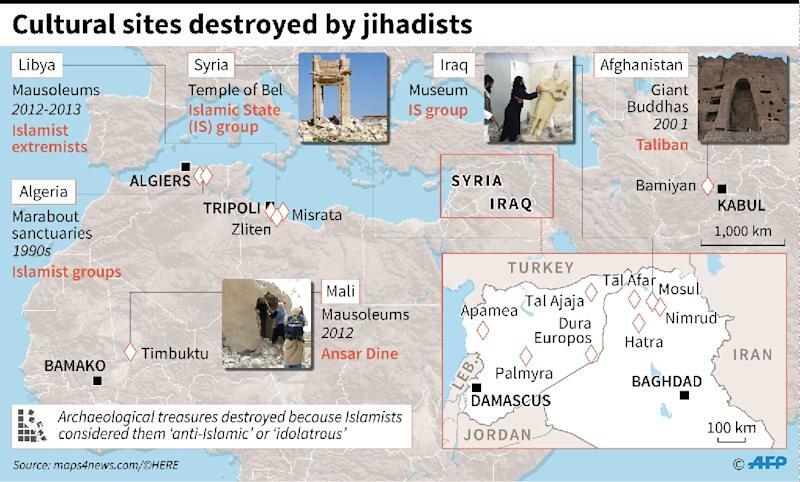 However, the IS group is not the only one responsible for ravaging Syria's heritage, with all sides in the fighting looting and destroying ancient sites. "Two thirds of the ancient city of Aleppo have been bombarded and set on fire," according to UNESCO. IS has carried out a campaign of "cultural cleansing", razing part of ancient Mesopotamia's relics and looting others to sell valued artefacts on the black market. In a video released by IS on February 26, 2015 militants were shown using sledgehammers to smash pre-Islamic treasures in the museum in the country's second city Mosul, sparking global outrage. Thousands of books and rare manuscripts were also burned in February in Mosul's library. According to the Iraqi government, IS militants on March 5, 2015 bulldozed and blew up Nimrud, an ancient Assyrian city south of Mosul. They also attacked Hatra, a Roman-period site, in the northern Niniveh province. Several mausoleums have been destroyed by Islamist extremists since the overthrow of longtime dictator Moamer Kadhafi in 2011. In August 2012, Islamist hardliners bulldozed part of the mausoleum of Al-Shaab Al-Dahman, close to the centre of the Libyan capital. The demolition came a day after hardliners blew up the mausoleum of Sheikh Abdessalem al-Asmar in the western city of Zliten. In 2013 suspected Islamic extremists destroyed the centuries-old mausoleum of Murad Agha in Tripoli, but the tomb inside withstood the attack. In March 2001, Taliban leader Mullah Omar ordered the destruction of two 1,500-year-old Buddha statues in the eastern town of Bamiyan, because they were judged to be anti-Islamic. Hundreds of members of the Taliban from across the country spent more than three weeks demolishing the gigantic statues carved into the side of a cliff. In 2003 the cultural landscape and archaeological remains of the Bamiyan Valley were put on UNESCO'S world heritage list. Armed Islamic groups in the 1990s destroyed several sanctuaries which dotted Algerian soil.